The study logo was created by Navajo Birth Cohort Study Team Member, Sandy Ramone, and has strong cultural significance. 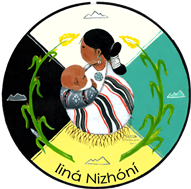 Iiná Nizhóní is translated to A Beautiful Life for Mother and Baby in English. Child birth is one of the most sacred events for a Diné family. Ultimate desire of all Nihokáá Dine’é (“Worldly People”) is to achieve a Iiná Nizhóní (a “life beautiful”) before and after the birth of a child. The white blanket with stripes is an traditional design, reflective of age-old Navajo teachings that continue today. The baby represents all Navajo newborns and their quest for a beautiful life. The four mountains represent the four Navajo sacred mountains and also emphasize that study will be Navajo Nation-wide. National Institute for Occupational Safety and Health. Hazard Evaluations and Technical Assistance Branch. Preventing baby bottle tooth decay in American Indian and Alaska native communities: a model for planning.